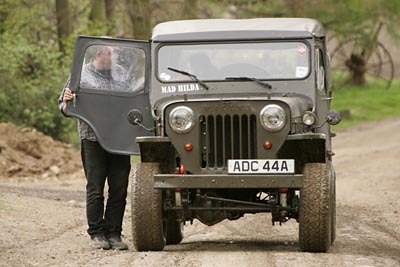 John Carroll (currently editor at Classic Land Rover magazine) is a bit of a fixture on the four-wheeling scene in the UK (and also across the channel in the rest of Europe) with his Jeeps including the remodelled Mahindra CJ340 "Mad Hilda" (left) and a restored French Hotchkiss M201 (190K JPEG). The October-November 1997 issue of Jp magazine included an article by John called "The Mahindra Jeep" (see below), discussing his 1989 CJ340 and the history of the licencing agreement between Willys and the Mahindra company in India. In 1997 John had already made some modifications to his Jeep, and since then he has continued to bulletproof it and Willys-ize it, with side mounted spare, Willys fenders, grille and hood, rear PTO winch, CJ-5 wheels with Goodrich MTs, Willys seats, Smittybilt rollbar, Bestop, Rancho springs and more. He says, "I love it, it's the same Jeep I've driven almost continually since 1989." John has taken Mad Hilda offroad in a number of countries over the years. The photo above shows her with chains in Scotland. At left is a discussion about who's going to drive, on a dirt road closer to home in West Yorkshire, England. The name was coined by a friend who thought the Mahindra name sounded like "Mad Hilda," and it stuck, especially after John painted it on the windscreen. 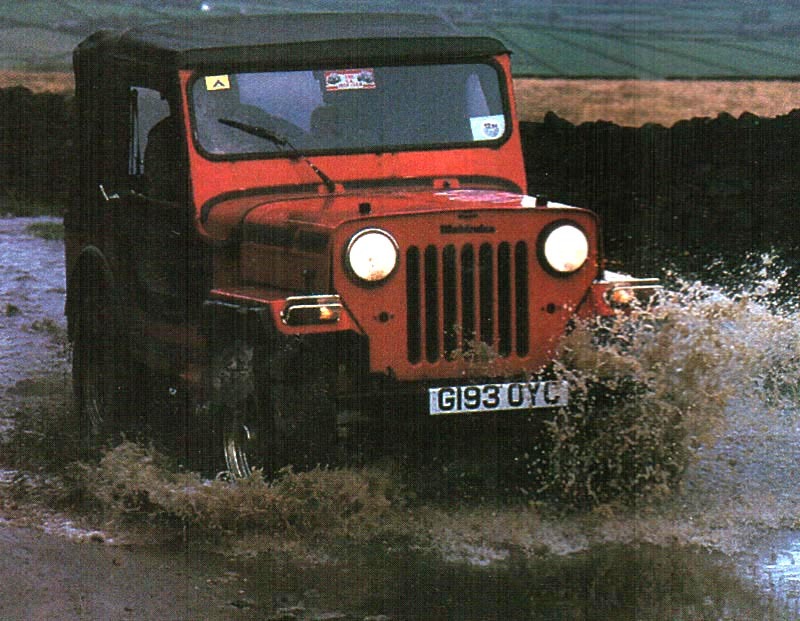 In his 1997 article below, John provides some background on the company, and a look at his early experiences with the Jeep in its original red livery. A light, general purpose 4x4 with flat fenders, an 80-inch wheelbase, leaf-sprung live axles, part-time four-wheel drive and a transmission brake still made in the Nineties? You bet, courtesy of an auto plant in India. In the years immediately after World War II, two Indian brothers, J.C. and K.C. 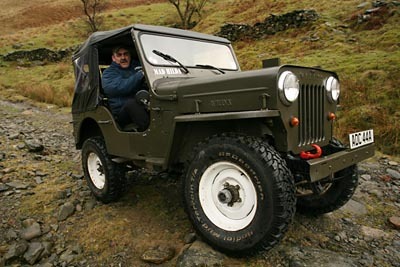 Mahindra, started assembling completely knocked-down (CKD) Willys Jeeps that were imported to India from the US. K.C. was a graduate of the famous English University of Oxford, and his brother J.C. had a background in the iron and steel industry. 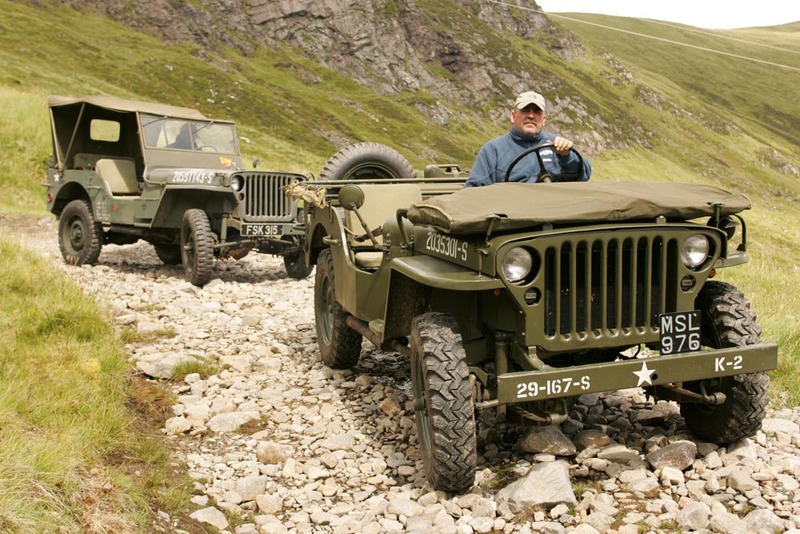 In the early days of their operation, only 10 percent of the components for the Willys Jeeps were sourced in India, but this percentage gradually increased to 17 percent. In the 1950s things really took off for the Mahindra brothers; plans were submitted to the Indian government in 1954 to increase the amount of Indian-manufactured parts and decrease the number of CKD kits imported. The plans were approved, and in April 1955 the company purchased a factory at Bhandup, and gradually the Mahindra Company shifted from assembling CKD Jeeps to license building Jeeps. Mahindra's entry into vehicle manufacturing gave numerous small component manufacturers a chance to become established, and so helped the Indian economy. By 1958 things were going so well the government permitted the Mahindra concern to increase production to 5,500 vehicles per year. Demand increased, and by 1961 the company was making 10,000 vehicles per year. This figure continued to increase, and by 1984 Mahindra was making 18,000 Jeeps annually. 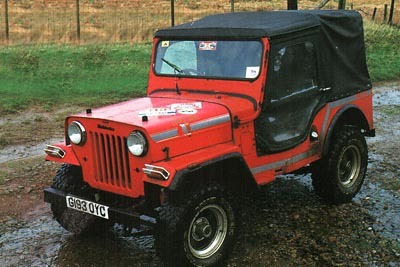 The company was still producing CJ-3B models and a long wheelbase variant known as the CJ-4 (this designation has only been used in India, except for the prototype CJ-4 made by Willys, and featured in the June/July 1997 issue of Jp Magazine) which has 91 inches between the axles. English and satellite-screened television programs such as "Perpetual Motion" have revealed the secret of India's motor industry. The Indians produce a variety of vehicles, considered obsolete in their country of origin, through licensing or manufacturing agreements. Royal Enfield motorcycles, Italian scooters, Morris Oxford automobiles and Willys Jeeps are all made in this way. By 1984, of course, the Willys CJ-3B had long been discontinued in the US, but in India the philosophy was clearly "why change a good thing?" 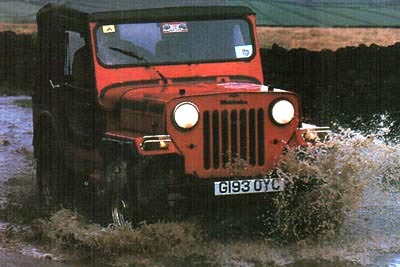 As recently as 1991 the company produced 30,100 Jeeps and even supplied $35,000,000 worth of Jeeps in CKD form to Iran. It is ironic that a company that started by assembling CKD kits now supplies them to other countries. Much of the reason for such massively increased production was the demand for exports such as this. Europe was seen as a potential market, and as diesel engines are a popular choice in 4x4s, European-destined Jeeps were fitted with Peugeot 2112cc XDP diesel engines. Mahindra became the only company outside France licensed to build this engine, and has an engine plant at Igatpuri for this purpose. Mahindra Jeeps, for domestic and other export markets, are still built with a 72 bhp F-head four-cylinder engine. When purchasing a Mahindra Jeep, you are actually buying a new-old Jeep, which is one of the reasons that the Mahindra endeared itself to me. I purchased one new in 1989 and still have it. Kept outside year round, the Mahindra is regularly used to fulfill both the domestic transport and recreational requirements. 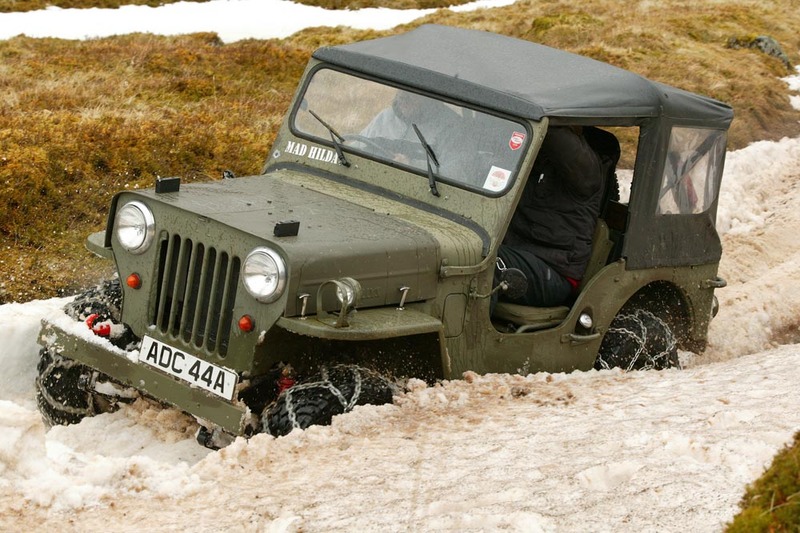 It is, of course, off-road that the Mahindra excels. The diesel engine, while it might not be ideal for on-road use, comes into its own off the tarmac. The 2112-cc diesel engine has plenty of torque at low revs. The Mahindra seems to keep its wheels in contact with uneven ground, and I believe that this is as a result of particularly flexible leaf springs. In terms of off-road performance this is important, particularly where the vehicle is, as this, running axles with standard open differentials. Mahindra Jeeps have the same five-stud wheel pattern as American Jeeps. 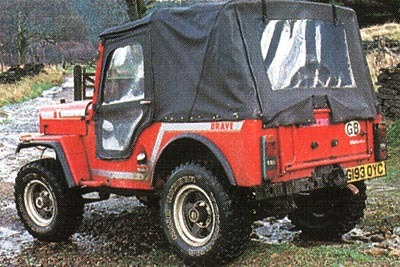 When new the Mahindra had rear quarter bumpers with plastic end caps and a front bumper with similar ends. These parts also had the effect of reducing approach and departure angles. Unbolting them left a more purposeful-looking Jeep; the original type Willys bumper was revealed at the front. Another reason why the Mahindra performs well off-road is its short front and rear overhangs, and subsequent good approach and departure angles. The Mahindra's dimensions are 523mm and 756mm. This gives an approach angle of 46 degrees and a departure of 35 degrees. These figures are quoted from manufacturer's specifications, and I have to say that I'm not convinced of their accuracy. I believe it is greater than 35 degrees, particularly after the removal of the quarter bumpers and repositioning of the license plate. The removal of these parts and a few more convinced me that underneath many of the modern parts was a real Jeep trying to get out. 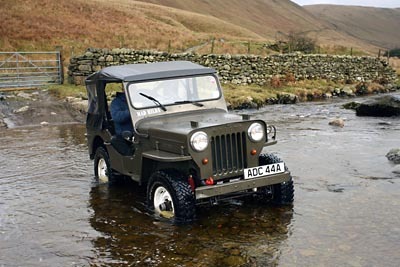 It is most often the new parts that let down both the quality and appearance of the Mahindra Jeep which is, after all, a 1955-63 CJ-3B. The major difference between a real CJ-3B and a Mahindra CJ-340 is the engine and transmission. Willys didn't fit Peugeot diesels to their Jeeps, but a four-cylinder F-head hurricane engine. This is taller than what had come before, hence the taller bonnet and grille. The transmission is four-speed in the Mahindra, whereas in a CJ-3B it would have been a three-speed. 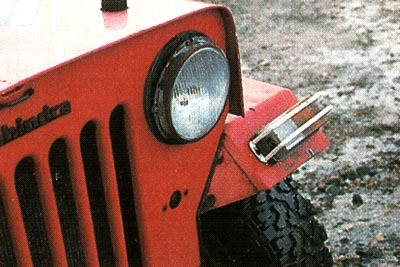 Mahindra uses slightly different and not as aesthetically pleasing wings, on which the sidelights and turn signals are mounted to conform to European legislation, something that also affects the positioning of the same lights on the 1997 TJ Wrangler. The photographs show these mounted at an angle on this Mahindra. When new, they were vertically-mounted on glass fiber pods. Vibration shook these loose, so I removed them, which also slightly improved the lines of the wings. Another minor modification involved repositioning the license plate for tow hitch clearance. This left the crossmember free to accept a towing hitch -- it is already drilled for a Jeep pattern NATO hitch, so that's what I installed. It is a basic machine, but my spine confirms one thing -- the vinyl-covered, high-back seats in the Mahindra are far more comfortable than the fabric-covered, low-back originals. The Mahindra seats also have head restraints. Much of the remainder of the interior is similarly modernized -- a plastic steering wheel and inertia-reel seat belts, for example. Reliability of the vehicle hasn't been an issue, although I have spent many hours working on it. When it was new there were some teething problems-poor electrics and such. These were ironed out early on, mostly with a pair of crimping pliers and a couple of relays. The more recent repairs haven't been as a result of the vehicle's failings, but human failings. The stickers on the bonnet testify to the Mahindra's having been on lengthy foreign trips. Despite off-roading while abroad, the Mahindra always got me home. I've no plans to sell the Mahindra -- the best days away from the tarmac don't involve a roof anyway! With real flat fender wings and one or two other modifications that I have in mind, I foresee a lot more four-wheeling in the Mahindra. John painted a 1994 Mahindra CJ340 pink, for young friend Lizzy Thornton, who was hoping to have her UK driver's licence soon. Check out the rear view photo (100K JPEG). See more features on Mahindra Jeeps on CJ3B.info.